After the subprime crisis, vulture funds swept into the hardest-hit areas and bought thousands of foreclosed-upon homes at firesale prices and floated bonds based on the expected returns from the rents they'd be able to charge in an America with the lowest levels of home-ownership in modern history. To keep the bond-ratings high (and to support the derivative bonds that hang off of those bonds), these Wall Street landlords have raised rents to historic highs and figured out how to evict everyone, demonstrating to bond-raters that these houses could be flipped onto the market and sold at the drop of a hat, should the winds shift. 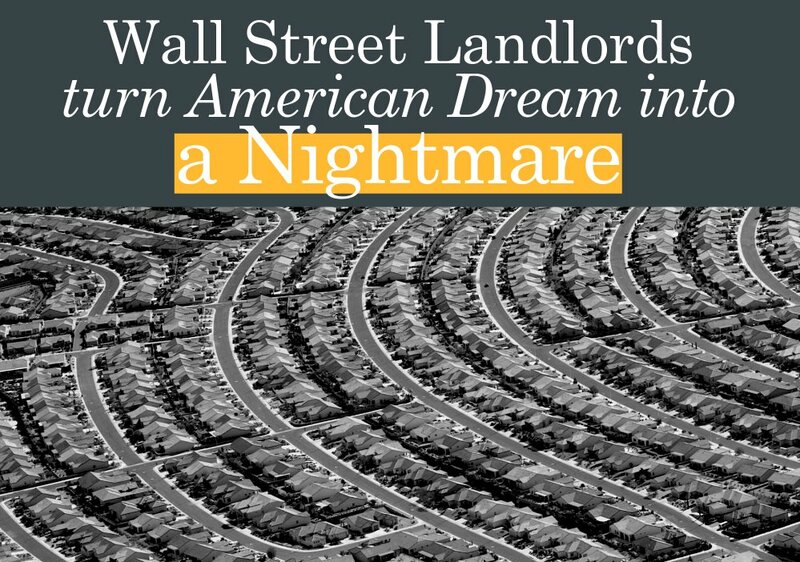 In AFR Report: Wall Street and Single Family Rentals, researchers for the Americans for Financial Reform run the numbers on 200,000 single-family homes that are owned by private equity landlords in 13 states -- a small, but representative sample of all the homes these Wall Street behemoths own. They find that every factor that makes these homes sound investments also makes them miserable slums. To save money on maintenance, corporate landlords have commissioned how-to videos that explain to their tenants how to rewire their own nonfunctional electric outlets and fix their own plumbing. Steady flows to the bondholders are guaranteed by a raft of sky-high, non-negotiable "fees" for customary rental amenities, and corporate landlords systematically exploit legal loopholes in order to raise rents by 25% or more on no notice. What's more, these corporate landlords are subsidized by the taxpayer, thanks to loan-backing from Fannie and Freddie. The companies also reported maximizing profits through what the report terms “fee gouging” and shifting maintenance costs onto tenants. In addition to producing a series of DIY maintenance videos, covering topics such as “how to fix outlets that don’t work,” Invitation Homes began charging “pet rent”— a special monthly fee on top of both pet deposits and regular, human rent. In a 2017 earnings call with investors, Invitation Homes reported that pet rents accounted for $1.5 million in additional corporate income. Tenants profiled in the report also alleged that they had been threatened with eviction after reporting maintenance issues. One renter claimed that just five days after filing a complaint over a sewage leak caused by broken pipes, he received a 60-day notice to vacate from Starwood Waypoint.